Still Alice feels like something you’ve seen before. It’s rather straightforward in its construction. The narrative documents the degradation of a woman‘s mental faculties from a condition. Judi Dench in Iris, Gena Rowlands in The Notebook, Julie Christie in Away from Her. We have seen this affliction depicted before. Here, however, it affects a younger woman diagnosed with early onset Alzheimer’s disease. To heighten the stakes, she’s a brilliant academic at the peak of her career. Julianne Moore has always been known for her portrayals of women who must endure traumatizing experiences and Still Alice is no exception. The production is most successful as a document of the illness itself as it impairs Dr. Alice Howland. Julianne Moore portrays a professor at Columbia University whose area of expertise is linguistics. If anyone can be labeled with a highly developed cognitive ability, it’s her. Richard Glatzer and Wash Westmoreland pen a screenplay they adapted from Lisa Genova’s bestselling novel. Initially the effects manifest itself in little “senior moments” that had me thinking that I might actually have early onset Alzheimer’s. It attempts to depict how the disease affects her family as well as the individual. The way her various family members react and adapt to the unsettling news isn‘t foreseeable. Husband (Alec Baldwin) and oldest daughter (Kate Bosworth) don’t want to confront the reality. Meanwhile her youngest and more independently minded daughter (Kristen Stewart), is a more accepting. 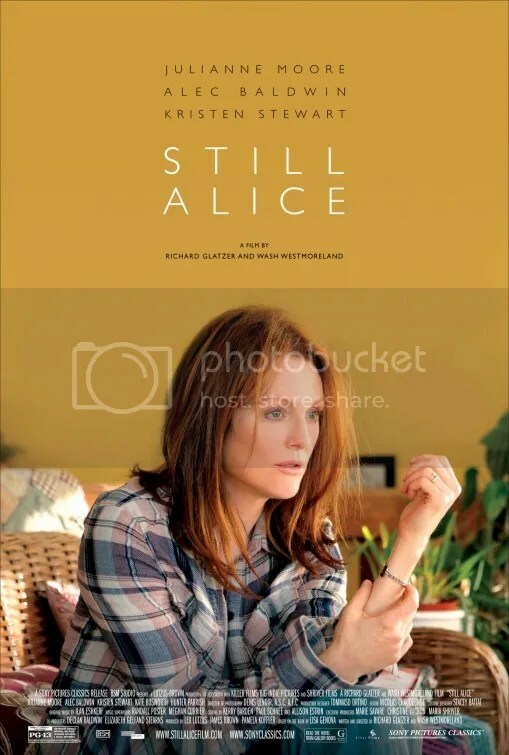 Still Alice is a beautifully acted film with a stunningly sincere performance by Julianne Moore at its center. She is what sets this mostly conventional tale apart. Moore genuinely conveys the helplessness at losing your memory while still being aware of what’s happening. At one point she records a video message directed at her less cognizant future self. Her shocking directions are absolutely chilling in their matter-of-factness. And yet there’s an ostentatious air about the production that keeps us at a distance. Alice and her WASPy family are the picture of a privileged life. She and her husband are an educated, wealthy couple with 3 attractive adult children, polite well mannered in their exquisitely decorated Manhattan brownstone. She’s just turned 50 though with her gorgeous face, she doesn’t look it. All of this almost scientifically designed to make the tragedy of her ultimate predicament even more emotional. Still Alice is perhaps the most empathetic presentation of the helplessness an individual afflicted with alzheimer’s truly feels. To that end, Julianne Moore renders an extraordinary achievement in a drama that sits comfortably in the sudsy water of a sentimental tearjerker. This entry was posted on December 15, 2014 at 1:54 am and is filed under Drama with tags 2014. You can follow any responses to this entry through the RSS 2.0 feed. You can leave a response, or trackback from your own site. great review. really enjoyed this movie! It was good although it feels a little like a movie you’d see on the Lifetime TV Network. Good review Mark. For me, the performances really made it worth the watch. Them, and also the fact that they never seemed to fully make Alice out to be some sort of saint. Julianne Moore was clearly the MVP for this movie. Nobody else in the production was at her level though. Excellent review sir. Pains me to hear that the production isn’t a little more novel surrounding what is shaping up to be another stalwart performance by everyone’s favorite Julianne Moore. But you know, in some strange way I think the fact the screenplay sounds like it’s bending to the whims of a strong central performance makes this a more digestible film for me. A really serious movie about Alzheimer’s is going to be no easy task to watch. Especially if all elements work together to the same ends. What a horrible illness. Yeah in many ways Alzheimer’s is so dreadful that it’s enough. No need to add a lot of superfluous stuff. We are in agreement with this film with near similar ratings. Beautiful and tragic depiction of brilliance flickering away due to this horrible illness, all the more heartbreaking since Moore still looks every bit vibrant and at the peak of her health/age. Kristin Stewart as the daughter that provides compassionate care was lovely. Personally I liked Rosamund Pike more in Gone Girl, but Julianne Moore is my current pick to win the Academy Award. She’s very good but if she wins, it’s because of her career. This isn’t the greatest film in her filmography.